Let’s say you have a great idea for an e-learning course business. You almost have everything down: A profile for your niche, lesson plans, content, marketing strategies, etc. Your only challenge at this point is you can’t figure out which course sellers’ platform you ought to use for your online business. You’re torn between Kajabi or Thinkific — two of the leading platforms in the space. To help you decide which online tool to use for your online course business, we’ve come up with a comprehensive review of both platforms. Kajabi and Thinkific are learning management systems (LMS), in that they’re basically content management systems (CMS) that are optimized for educational content. But these platforms are more than LMSes. They’re full-fledged platforms that help entrepreneurs create, market, and establish their online course businesses. They help both those with heaps of digital marketing savvy and the hapless souls with no coding or marketing experience to kickstart their e-learning businesses without much fuss. Using a platform like this gives you the opportunity to focus more on the quality of your content without compromising the other crucial aspects of your future online business. Though they may sound like they offer practically the same thing, there are some key differences between Kajabi and Thinkific that you should consider. While this isn’t a feature, first impressions are important. After all, being able to try out the platform before deciding which one to use in the long run is a huge plus. Kajabi’s sign up process is direct to the point. Click the sign-up button and it will ask you for necessary details including your credit card information. It also straight up tells you that your free trial has a limited span of 14 days from the date of sign up. After signing up, you get to test-drive Kajabi to its maximum capacity for the next two weeks. Thinkific’s sign up page is also straightforward like Kajabi’s. It’ll ask you for your name, email, password, and for you to click the “Create Your Account” button. Thinkific will then ask a few you a few questions about yourself (and your business). Thinkific’s free trial has no expiration date and is part of the plans they offer. However, you can only use some of the platform’s features and set up only up to three (3) online courses. Considering how Thinkific gives you limited access to their features on their trial run, you won’t get to test drive its premium features — unlike Kajabi — making it difficult for you to decide if the platform is, in fact, what you need. An aspect to consider when choosing a platform for your online e-learning business is the online tools manageability. After signing up, both Kajabi and Thinkific will direct you to your dashboard. Kajabi’s and Thinkific’s dashboards look intuitive and user-friendly. They both have side menu bars that contain the tool’s core functions. Both platforms show you important statistics, such as your sales and number of members of the online course/s or digital product/s you’re selling through the platform on one page. Kajabi and Thinkific keep your dashboard simple, and everything is easy to navigate even for beginners on both platforms. The next aspect we’ll look into is the level of assistance you can get from both platforms, and the kind of customer support they provide. Kajabi has “Kajabi Assistant” — which you can always find on top of your dashboard — whether you’re uploading courses or tweaking your website. Simply click on the search bar and a huge serving of suggested FAQs are provided for by Kajabi, as well as a Quick Jump option to features under the four sidebar menu categories. For their customer support, Kajabi provides its users with both email and live chat support. On Thinkific’s dashboard, you need to spot the magnifying glass icon on top of the side menu bar to open the search bar. Nothing else is provided once you click on it. What you can search for at the moment is only limited to information about your own students and the courses you offer. You need to head over to their help center to find what you need. Thinkific provides its users with a hotline support as well as an email support. With Kajabi, there’s no phone support, but you can email, and upper-tier account holders get access to 24/7 support via live chat. Kajabi and Thinkific offer a variety of key features like web hosting and useful marketing tools to help make their sellers’ easier, all while giving you the capability to manage your online course business seamlessly. Because the website is an online business’s front door, a messy one would definitely turn off a potential client. Both of these knowledge commerce platforms have come up with themes that are sure-fire ways to catch people’s attention and keep them hooked to your page. For Kajabi’s part, they only have one theme. Their sites are built on the “Premiere Framework,” which you can customize using various layout presets, which are essentially sub-themes. This gives you the capability to do almost any kind of customization you like. Aside from this, Kajabi also offers a blog option, which you can use to communicate more with your course members as well as share your thoughts with the community you’re building. Thinkific, on the other hand, gives you limited access to themes you can use on your website. The themes they offer are simple and clean; minimalistic at best. Like with Kajabi, you can also change and set the typography and colors on your website. Thinkific’s themes also transition smoothly on mobile. The downside to Thinkific is the absence of a blog feature. You’d have to integrate a third-party blog service if you think you need it to boost your marketing. You’re likely best off opting for an LMS that would make it easy for you to manage your content instead of flooding you with features you have no use for yet. Kajabi offers product structure templates which they call “blueprints.” You can use these to make the process of creating courses a breeze. Kajabi also beautifies your courses with their own themes. All you need to do is click on a blueprint and just input all the needed details on the course you’re offering, as well as any visual aids you’d like your students to use such as videos and pdf files. Kajabi also lets you create “assessments” to quiz your students on what they’ve learned in each module of the courses they’re enrolled in. You can also use these quizzes as lead capture and data collection mechanisms that you can later use to segment your contacts for later nurturing and upsells. Thinkific provides you with templates as well, but this time with far more choices than Kajabi offers. It’s a huge help to be able to host more ways for your students to learn such as being able to host a library of downloadable files your students can purchase or host a webinar replay. Like Kajabi, Thinkific lets you upload modules in your courses but steps it up by letting you upload more media and more assessment tools such as surveys, quizzes, and exams. Both platforms’ processes of creating online courses are easy to navigate. 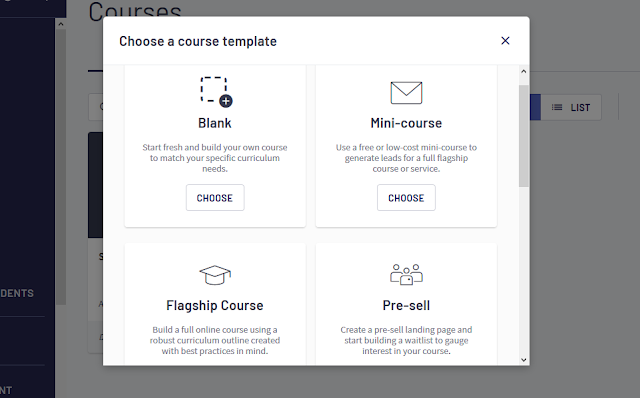 They have templates which you can use so you won’t have to start from scratch when creating your courses. The extent to which a platform aids you in ensuring your return of investment (ROI) is definitely a deal-breaker. Both Kajabi and Thinkific have their own ways of helping you market your business. Kajabi is a powerhouse when it comes to its marketing tools. Everything is housed under one roof. It offers you marketing “pipelines,” which are essentially automation workflows based on product rollouts and funnel structures. The platform provides you with your own email campaigns along with automated actions you can set based on your online business’s needs. Aside from all of the above, Kajabi has an affiliate program in order for you to reach a wider audience by onboarding allies who will refer traffic your way in exchange for a bounty. Thinkific, on the other hand, relies on third party-integrations to work for you. Even though it isn’t under one roof, the integration process is not as time-consuming as you might think. Most of Thinkific’s third-party partners are also only available in their paid plans. However, it’s still a bit of a headache to sign up for each one if you don’t already have an account for each integration tool. Thinkific also uses coupons and sale widgets to primarily market your online courses. Lastly, it utilizes a similar affiliate program scheme as Kajabi. Thinkific’s marketing tools look underwhelming when placed side by side with Kajabi’s. You don’t have to depend on third-party providers since Kajabi already supplies you with everything you need. With Kajabi, you’re looking to pay around $119 to $399 per month depending on the type of plan and whether you’ll be paying monthly or annually. Depending on the package you’re subscribed to, Kajabi lets you upload up to one hundred (100) products, have access to the “Hero Academy” which walks you through creating quality courses and offers 0% transaction fees. On the flip side of the coin, Thinkific’s price range starts at $39 and goes up to $499. The Basic plan lets you put up unlimited courses while the Pro plan and up offers the option for you to give out certificates of completion to your students. Both platforms offer 0% transaction fees for all plans. While Kajabi looks seemingly more expensive even for its Basic plan, Thinkific’s Basic plan is quite lacking. Kajabi may only offer a limit of three products and 1,000 users for its Basic package, but it gives you full access to its features that are also available for its higher priced packages. Thinkific’s Basic package may offer unlimited courses for you to upload, but their marketing features still leaves much to be desired, many you’d find already in Kajabi’s Basic plan. 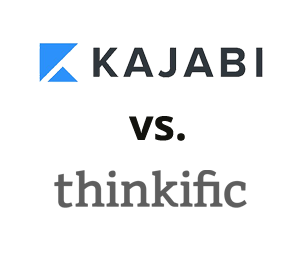 It’s widely accepted that Kajabi and Thinkific each have valuable marketing features. Their professional-looking themes are easy to use, and their content creation process is uncomplicated. Both are reliable solutions for your e-learning business and selling online courses. However, while both platforms get the job done, Kajabi outshines Thinkific in that it’s not just an LMS, it’s a true all-in-one tool that solves your marketing problems with its powerful sales and quality content creation tools. When you think about how crucial marketing is to the success of any online business, you can’t ignore the value that Kajabi brings to the table. After all, with over three million pages that are published daily, your online course business will never fly if you don’t have a reliable tool that can help you market your online courses. Kajabi helps you with that, and then some.